This stab at an epic drama about the 1960's has some interesting scenes but ultimately falls apart. Steve Tesich's autobiographical script is heartfelt but unfocused: it never finds the right balance of personal drama and social allegory it is looking for and suffers from some abrupt transitions at key dramatic moments that pull the viewer out of the story. It's also so stacked with characters that some never get to develop properly (with the exception of one key scene, the character of Jim gets to do little besides stand around). Arthur Penn's direction is sensitive to his actors but it suffers from an unsteadiness of tone like the script: a few moments that veer into high comedy or unexpected tragedy are jarring and work against the story's flow. In terms of performances, there is a winning turn from Craig Wasson as main character Danilo but Jodi Thelen's overstated, oft-campy work as Georgia makes the character annoying when she should be mesmerizing. In fairness to Thelen, the script often forces her character to act out in illogical ways but the overall lack of subtlety in both writing and performance work together to make this characterization ring false -- and that's a major problem because the film depends on her character being some mythical representation of youthful American freedom. 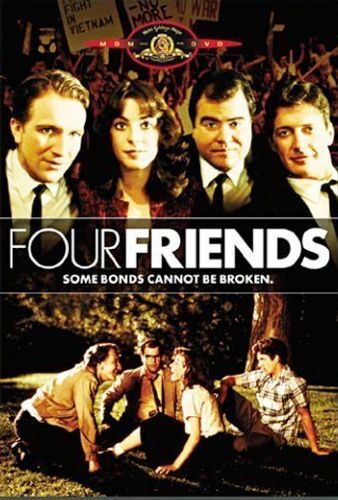 In short, Four Friends is an intriguing but deeply flawed work that strains under the weight of its own ambitions.